The Matrix food court is now under the management of Wits. Wits University has taken over the management of the retail outlets at The Matrix since the beginning of July. 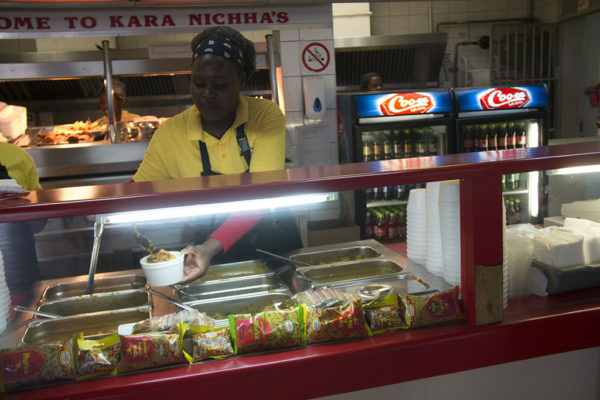 Karra Nicha’s will continue to operate at the food court following negotiations with the university’s retail services. The university’s retail services signed an agreement to take over all the contractual agreements of the retailers operating at The Matrix with Micromatica, the company that had previously managed The Matrix food court at the institution’s main campus. Workers at Karra Nicha’s are to sign the recently amended Workers’ Charter as the eatery is now under Wits management. According to Senior Communications Officer, Buhle Zuma, “these lease agreements will reinforce the rights contained in the Workers’ Charter to be agreed upon by the retail operators and their employees. The University will also ensure that all retail operators sign the Workers’ Charter”. Chair of the Insourcing Task Team, Advocate Dali Mpofu, addressed workers from the retailers and maintenance fraternities in a meeting on Thursday morning. He said the university was looking to “top up workers’ salaries”. He added that the ITT insisted to the University Council that retail workers should be able to gain access to facilities at the institution. “Retail workers, because they work on the premises of Wits, should get some of the benefits of full time workers and the minimum conditions of their services should be adhered to. Manager of Karra Nicha’s, Kaushik Mistry, confirmed to Wits Vuvuzela that the eatery would continue to trade. “The shop is not closing anymore. I’m happy that we are not closing. Wits has taken over from Micromatica and we were told Wits would take over from July,” he said. Mistry added that they were in talks with the university to make an arrangement for their rent. Wits Vuvuzela reported on May 20 that the eatery was closing down because of their failure to pay their arears of over R150 000. “We’re still paying rent to Micromatica. We had a meeting with Wits and they told us they were going to let us know at the end of August what’s going to happen regarding our debt,” said Mistry. He added that the shop was being kept at the university to benefit Wits students as Karra Nicha’s offered a more affordable food option. “We decided to keep the shop for the benefit of our customers; the students and our staff,” he said. The Deputy Director at Wits Services, Nicholas Matthes, did not respond to Wits Vuvuzela’s several requests to comment on the details of the financial arrangements with the eatery. Wits Vuvuzela, Financial pressure forces closure of Kara Nichha’s, May 20, 2017.